Following the sad passing of Redvers Davies on the 12th of February here follows the contents of an article placed in the One Voice Wales monthly on line newspaper last year. I worked with Redvers Davies on the Community Council for twenty seven years and it is remarkable that I do not recall us ever falling out on an issue. A remarkable man, a full life and active to the end and we will all miss him. Solomon Northup was recently portrayed in a feature film as someone who had been “Twelve Years a Slave”, against his will. 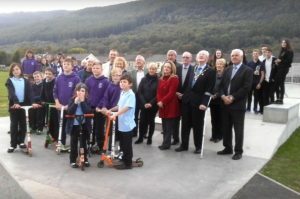 This is counterbalanced by the feat of Resolven Community Councillor Redvers Davies who, at the age of 90 has completed fifty four years in public life quite voluntarily. This makes him the oldest serving councillor in England and Wales. Redvers was born in the small village of Pontwalby near Glynneath on the 30th May 1927. He was educated at Glynneath Boys School and Neath Technical College. During the 1939-45 war, he served as a Bevin Boy at the Rock Colliery, Glynneath. He recalls vividly, that having lost his father at only seventeen years of age he was given special dispensation to look after his mother by working locally. After the War he attended night school at the Trefforest School of Mines, which sometimes led to a very long day having to return to work a night shift at the Empire Colliery, Cwmgwrach. Subsequently, he became a fully qualified mining engineer and worked across the South Wales coalfield in an array of collieries. When the coal mining industry started its long decline, Redvers began a new career working for Calor Gas at Aberdulais where he worked for twenty five years until his retirement. In March 1952 he married his wife Jean, a nurse, in St. John’s Church Skewen. His political career in local government started in 1963, when he was elected on to the Neath Lower Parish Council. In 1984 following the advent of community councils, he began representing Abergarwed on the new Resolven Community Council a seat which he holds to this day. In that time he has been Chairman and vice Chairman a total of six times, which is quite a feat. 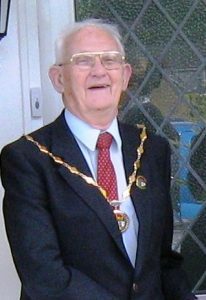 He then took on duties at national level, holding several committee posts with NALC and was also Chairman of the Wales Council for two years. Following the establishment of One Voice Wales after devolution Redvers became a member of the Executive committee as well as chairing a number of other committees. 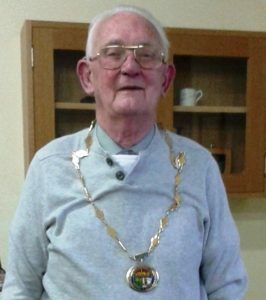 He has very recently been re-elected Chairman of the Neath Port Talbot Area Committee (they will soon say that life begins at 90!!). He also has an interest in the field of Health and was a Welsh Assembly member of the Community Health Council for ten and a half years as well as serving as a member of the Statutory Reference Group of Abertawe Bro Morgannwg Health Authority. 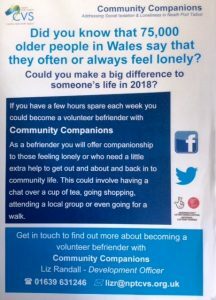 Redvers combines this with an active interest in the local CVS as a trustee, secretary of the Abergarwed Welfare Fund, Chairman of the Neath Port Talbot Tinnitus Group and in his “spare”, time volunteers for work as an assistant librarian in the Resolven Cyber and Resources Centre. Redvers also maintains an interest in sport. It should not be shouted from the Resolven rooftops that as a young man, Redvers Davies captained Resolven’s arch rivals Glynneath RFC at rugby. He also has an interest in cricket which he followed avidly with his late wife, before her death in 2010. 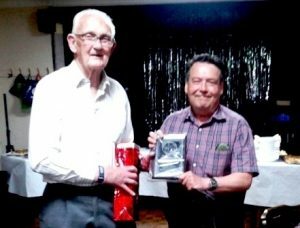 In the age of Twitter and Facebook it is remarkable that the community of Resolven managed to keep the fact that Redvers had a surprise birthday party lined up for him at the Miners’ Welfare in Resolven. On a sweltering evening, Redvers ( in his best clothes) had been told by his daughter that he was being taken for a family meal only to be surprised by a rousing “Happy Birthday”, sung by over sixty guests ( in casual clothing) including his two grand-daughters and three great-grand-daughters. 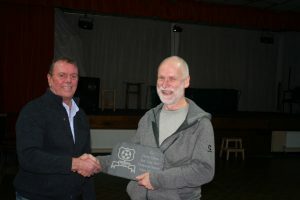 He was then presented with a plaque by the Chair of Resolfen Community Council, Trefor Jones, noting his remarkable achievement. This was all the more noteworthy in that Redvers had the distinction of being the longest serving, if not quite, the oldest councillor in England and Wales. The message is clear, if you want to live a long and prosperous life, keep active. If you want it to be even more interesting and worthwhile become a councillor!!!! Post script: Redvers was to be recognised at the AGM of One Voice Wales in October, unfortunately he was in hospital following a fall at home. 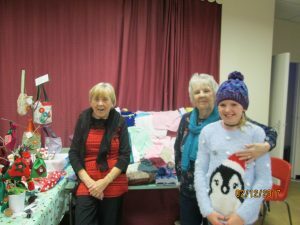 What has Ynysfach WI been up to? After a very busy December – filled with a carol concert, the Christmas Fayre, a delicious Christmas lunch and a lively party in the Church Hall, we were all glad to have a spell of quiet relaxation and a rest for the digestive system. 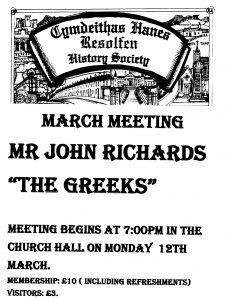 However we were soon back together for our January meeting, looking forward to the coming year with our new programme of monthly speakers and outings. We were delighted to welcome Jemma Langdon and Lyn Evans to our meeting, these two very busy health professionals from Resolven had worked hard to acquire two public access defibrillators for our community. However they needed to raise funds to purchase the all-weather cases that would enable this life-saving equipment to be available at all times. 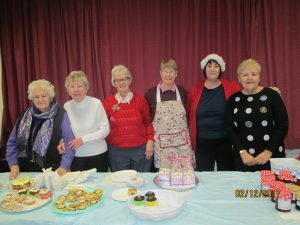 Ynysfach WI decided to donate all the proceeds from our Cake and Craft stall at the Christmas Fayre to this very worthy cause. 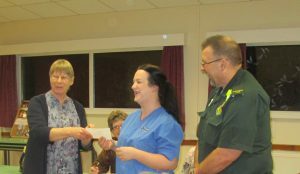 We were pleased to present a cheque for £473 to Jemma and Lyn and we thanked them for their hard work on behalf of our community. Following the presentation they both had to rush off to start the night shift! In keeping with our fund raising, our speaker for the evening was Gerard Rothwell from the Wales Ambulance Service Trust who is the National Public Access Defibrillator Officer. 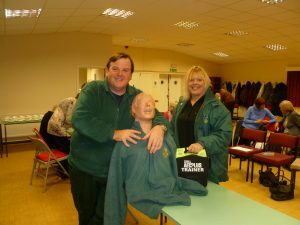 Gerard gave a most interesting and informative talk and demonstration of the use of the defibrillator in the case of a sudden cardiac arrest – we were left in no doubt as to the vital role a local defibrillator can play when every second counts. We ended the meeting very pleased that we had been able to help provide such an important piece of apparatus for Resolven. At our February meeting our speaker was Debra John, an actress from Swansea who comes dressed as an historical character and holds us all spell-bound for the whole of her performance. This was Debra’s fourth visit to one of our meetings and this time her character was a Victorian gentlewoman who had fallen on hard times and had ended up in the Debtors Prison in Swansea Castle. Debra weaves a tale that draws you in, and her descriptions are so vivid that you look around almost expecting to see the dreadful situation that she describes. Her tale is carefully researched and full of historical details – how she remembers it all without a pause or any notes I just don’t know. 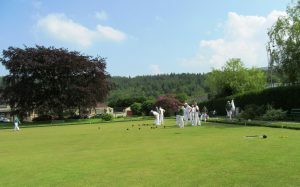 We are looking forward to our trip to Abergavenny next week, our inter-WI skittles match with our neighbouring groups in Glynneath, Crynant and Cadoxton and our celebration Welsh night in March. The WI can’t sit still for long! http://resolvendistrictnews.co.uk/wp-content/uploads/2017/10/logo-1-300x41.png 0 0 Ed1 http://resolvendistrictnews.co.uk/wp-content/uploads/2017/10/logo-1-300x41.png Ed12018-02-25 15:55:592018-02-25 15:55:59What has Ynysfach WI been up to? 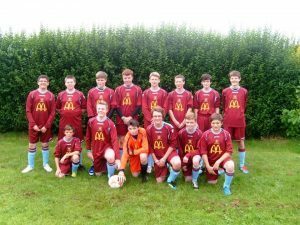 2018 is a very sad year for sport in the village of Resolven, for after 24 years, and hundreds of children passing through their ranks, Resolven Junior Football Club has folded. 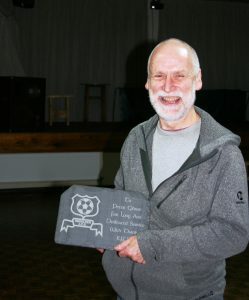 Clive formed the side alongside Mr Steve Hadley back in 1994, when they realised that if children of the village wanted to play football on a Saturday morning, they had to travel to Neath, Glynneath or even Skewen. Things were really hard to start with, but as the years went by more and more children wanting to play and their parents getting involved with coaching the different ages, and the club went from strength to strength. 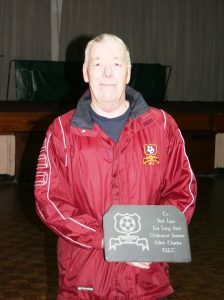 Clive stated “This club was set up so that children could get out on a Saturday morning to get some fresh air in their lungs, make new friends and above all to have fun”. 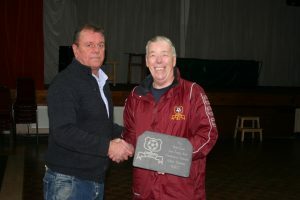 The club was set up for the children of the village, and at the end of each season the club would hold a presentation to reward the children for their commitment over the season. At the presentation every player would be presented with an article of clothing, with the club badge, and a trophy. 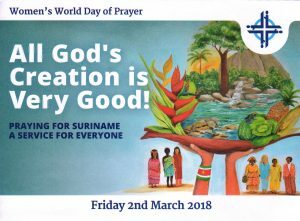 Women’s World Day of Prayer takes place the first Sunday in March every year. It is a Service put together by women and the same service is celebrated across the world, starting in Oceania and then across to the Americas. Also, each year a different country compiles the programme and this year the women of Suriname, a small country to the north of Brazil with a population of 540,000 with 90% of those living in the coastal areas. This month’s speaker was the highly amusing and entertaining Huw Williams of Merthyr Tudful. Huw has visited us on many occasions and also held an adult education class in Resolven some years ago, an experience he recalls with affection. His topic this year was “Sweet Bêr Dâr”, a term which was used by its residents to describe Aberdare and its district. Its bilingual construction is indicative of the complex history of the valley and betrays far more of its history than the English version of “Queen of the Valley”. 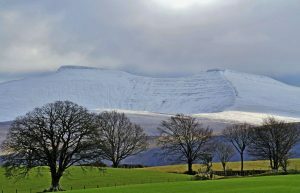 To others, including the residents of the Neath Valley, the residents were known as “Snakes”, its derivation unclear, though it may refer to strike breaking or be biblical in origin. He described the valley at the beginning of the eighteenth century as being heavily wooded with oak trees. Indeed, a popular and probable myth in the Cynon Valley was that Nelson’s poop deck on the Victory at Trafalgar in 1805, came from Aberdare. 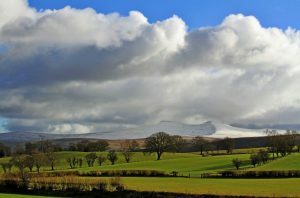 Its geographical location as an open ended valley made migration easy for the residents of rural west Wales to migrate to the area as it was industrialised with iron smelting and coal mining in the early years of the eighteenth century. The migrants had to confront the challenge of a dangerous if comparatively well paid employment, but this was compensated by the lure of opportunity and housing which the pioneer mining valleys provided. 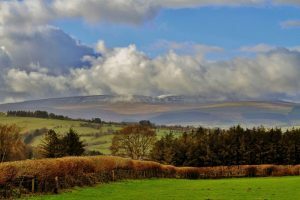 They had to learn a new language of industrialised terms, though they and their owners remained Welsh speaking (the Cynon Valley has a distinctive Welsh accent in Welsh closer to that of Montgomeryshire which is now rarely heard, Ed.) The nature of the coal seams arranged in a syncline meant that the prized steam coal which fuelled the world became deeper and collieries such as Deep Navigation were operating over a mile underground. Recent scholarship has pointed out that much of the capital investment came from Bristol and thus the connection with the slave trade. Mr Williams pointed out that this should be viewed in the context of its time and not propelled into our more politically correct era. The prize at Aberdare was the 4’ seam, and this was eventually located by Thomas Powell at Dyffryn, so maximising a fortune and the founding of the famous Powell Duffryn Coal Company. The increase in production was dramatic.in the 1840s the production was around 12,000 tons which was largely used for smelting, but by the 1870s it stood at two million tons which was being exported around the world, fuelling the Royal Navy. Brunel himself had realised the importance of the Cynon Valley and between 1839 and 41 constructed the Taff Vale Railway which allowed the less efficient canals to be replaced by rail. This led to the development of Cardiff and Barry as major coal exporting ports. 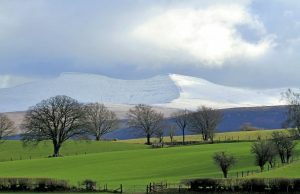 Mr Williams, now turned to four unique features of the history of the Aberdare compared to the rest of south Wales. Firstly, the area was the first to have an iron bridge spanning a river. He discussed the claims of Abraham Darby at Ironbridge and other claimants on the Taff but was convinced that the first was on the Dare. Secondly, the Cynon Valley was the first valley to become exclusive to the production of coal. By 1870, the coal foundries had disappeared and coal mining dominated, twenty years before the Rhondda Valleys. This over reliance was remarked upon at the time as being very dangerous economically, since any hiccup in the coal trade would affect the area disproportionately. This became apparent when the still productive coal mines closed in the twentieth century. Secondly, the Duffryn Colliery was the site of the first modern industrial dispute in 1843. Powell Duffryn dismissed 69 men and replaced them with another 200. This caused uproar, especially among the wives, who caused havoc by throwing pans and kettles at the new workers in favour of their partners. Cornish workers from the tin mines lasted one day when brought in to work, in the face of this militant sisterhood. Mr Williams stated that the role of women in the coalfield had always been prominent and that it was untrue that this had only appeared in the 1984/85 strike. A third feature, was the fact that Aberdare was the scene of the first explosion and major coal disaster, when in August 1845 scores of men and boys as young as 10 years of age were killed by a combination of an explosion and carbon monoxide poisoning at Powell Duffryn. The Jury at the inquiry which was composed mostly of coal owners,met at the Boot Inn Aberdare and suggested that the cause was the poor ventilation of noxious gases at the colliery. This was later rectified by Nixon at the Deep Navigation colliery. 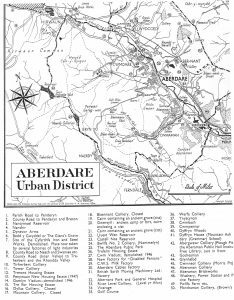 By 1851, the population of Aberdare stood at nearly 15,000, which though this would be eclipsed by Merthyr, gave it the fourth unique claim to be the first truly industrial community dominated by KingCoal. Following a lengthy question and answer session, Trefor Jones thanked Mr Williams for a highly informative talk. Congratulations to Simon Ace (seen left) and Stephen Allen (seen right) on being selected to represent Wales at the British Home Series Internationals in Paisley (Scotland) in March. This follows on from them gaining their first caps in 2017 in Belfast. 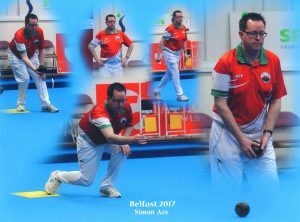 Simon will also represent Wales in the British singles championship after he won the Welsh National title in 2017. He has followed that up by reaching the 2018 Champion of Champions Final losing out to Daniel Salmon in a close fought match. Both the players play for Pontardawe Indoor B.C. in the Welsh club championships along with other Resolven bowlers: Nigel James, Ned Kelly; Gareth Evans; Martin Addis; Godfrey Brown; Shane James. Currently Pontardawe are having a good season having won the West Division to qualify for the Play offs for promotion to the Premier and they are still in the Welsh Cup their next opponents being Heatherton. The over 60’s team have also reached the quarter finals of their team championship. WATCH THIS SPACE FOR REPORTS AND RESULTS! 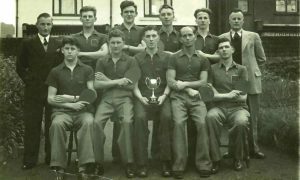 Table Tennis has been played in Resolven since the 1950’s at both the Miners’ Welfare and George Kent factory. 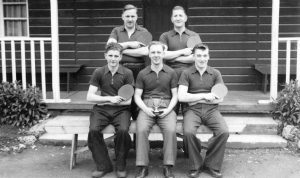 Some of the Welfare players: John Wicks, Ken Lewis, Denzil Sandry, Evan John Evans. Viv Hill, Denny Funning, Ron Rees, Len Jones, Selwyn Twaite. 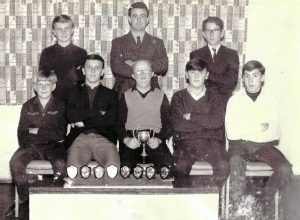 In the 1960’s & 70’s Resolven YMCA carried on the tradition under the leadership of Don Fearn and Bill Owen who entered a team in the Swansea League, such was the success that very soon there were as many as 7 teams playing from the YMCA. In this time they won every division from 1 – 7 the only title to elude them being the Premier. Rennison Edwards, Glyn Howells, Royston Stock, Keith Arnold, Conway Rogers, Keith Jones, Idris James, Paul Rees, Keri Guard, Peter Guard, Godfrey Brown, Dennis Bailey, Tony Sharpe, John Fryer, Ken Lewis, Len Jones, Ken & Glyn Davies, Terry Edwards Bert Geoghan, David Beynon, Gareth Evans. If anyone from these eras knows of more please let us know. In 1977 due to the declining interest in the YMCA, 2 teams moved to the Cam Gears Sports and Social Club where we are still playing. Players at that time were Gareth Evans, Paul Rees, Keri Guard, Ken Davies, John Fryer, Tony Sharpe, Terry Edwards. With so many players having played for our club it is rewarding to see that they have been recognised further afield such as Natasha Rees of Cwmgwrach who went on to represent Wales at a Commonwealth Games in India. 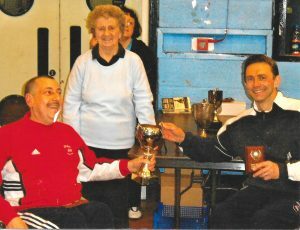 The club has had 2 wheelchair players in Martin Evans (Tonna) and Neil Robinson (Laleston) who have represented Great Britain at various Paralympics and have won medals. 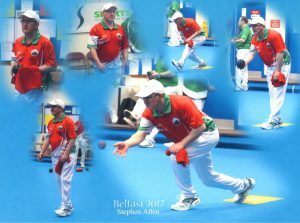 Neil is now a coach for the British Paralympics table tennis team. Players have also represented the Swansea League in the Welsh League including Gareth Evans, Randall Sims, Morgan Siddley and Ceri Higgon. 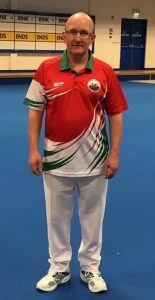 ***Gareth has represented West Wales as a director on the board of Table Tennis Wales and for a number of years organised and ran the Welsh League Championship. He is currently secretary for the Swansea League. 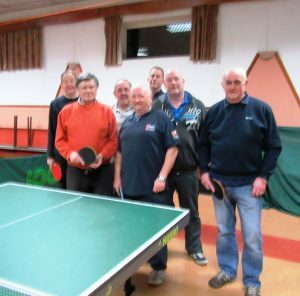 As secretary of the Cam Gears table tennis club he would like to have more Resolven residents take up the sport either socially or with a view to play in the Leagues. He has been playing for 57 years and would like to pass some of his experience on to new players and old players if they would like to return to the game— Emphasis being on enjoyment, keeping moderately fit and meeting new people. His telephone number is 01639 710475, mob 07854032758. Resolven Community Council has a vacancy for the above post. Duties include opening and closing the Community Centre when required and general cleaning. I took the above images from the village of Defynnog on January the 2nd. 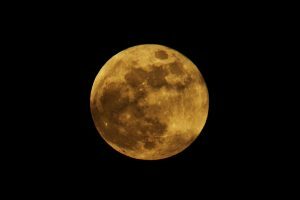 This image was taken over the Vale of Neath, and I was fortunate as we had heavy cloud, and when the moon was rising the clouds parted allowing me a fantastic view of our nearest celestial neighbour.